These collages are amongst my favorite posts. 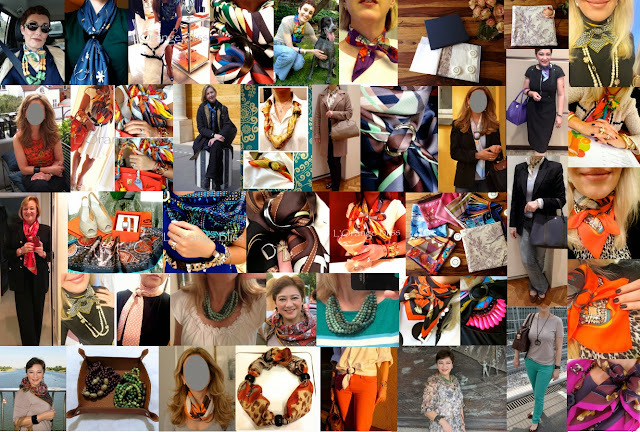 It is such a pleasure to see how the various collection items are worn by stylish women from all over the world. This collage consists of contributions from Australia, Austria, California, Denmark, Florida, France, Georgia, Germany, Hong Kong, Illinois, Indonesia, Italy, Singapore, Switzerland and Texas. A big thank you to Annarita, Andrea, Catherine, Celeste, Elizabeth M, Faux Fuchsia of 'Faux Fuchsia', Johanna, L'Orange Bliss of 'leorangebliss on Instagram', Macs of 'Macs in the city', Manuela, Marla in the OC, Monica, Pat, Sarah and sissy milano for participating, you ladies rock! Clockwise from top left: Annarita with a 'I like Flowes' 90 Carré, tied with a black horn Anneau Infinity in a slip knot. L'Orange Bliss with a 'Parures des Maharajas' 90 Carré, tied with a Grande light MoP scarf ring into an asymmetrical wrap. Marla in the OC with a 'Circuit 24 Faubourg' Gavroche, secured with a Petite scarf ring in a simple loop knot. L'Orange Bliss as before. From left to right: Johanna with a Twilly in tied in a criss-cross bow knot with a Petite scarf ring in dark honey. Annarita with a 'Photo Finish' 90 Carré, tied with a Moyenne dark MoP scarf ring in a criss-cross cowboy knot. Macs with a 'Bouclerie d'Attelage' 70 Carré, tied with a grande dark MoP scarf ring in the basic slide. Clockwise from top left: Manuela with a 'En Duo' 90 Carré and an Anneau Infinity in black horn. Faux Fuchsia with a Très Kelly 70 Carré and a moyenne scarf ring in a criss-cross bow knot. Johanna with a 'Trésors retrouvés' 90 Carré in an asymmetrical wrap, secured with a moyenne scarf ring in ebony. Faux Fuchsia with a 'Ecurie' 70 Carré in a cowboy knot, secured with a Moyenne horn scarf ring in honey. Clockwise from top left: Pam with a horn bracelet in noir/ivoire. Elizabeth M. with a Cavalcadour Maxi Twilly secured with a shawl ring. Macs with a Twilly secured in a loose Twilly wrap with a petite scarf ring. Manuela with a 'Des petits bonheurs' 90 Carré and a shawl ring in black horn. Clockwise from top left: Johanna with an african horn bracelet and a waterfall necklace in lagoon. Johanna's 'Evelyne' vide-poche with waterfall necklaces in raisin and lagoon. Catherine with a waterfall necklace in aqua. Monica's 'Monsieur et Madame' 90 Carré with a shawl ring in dark sunshine. 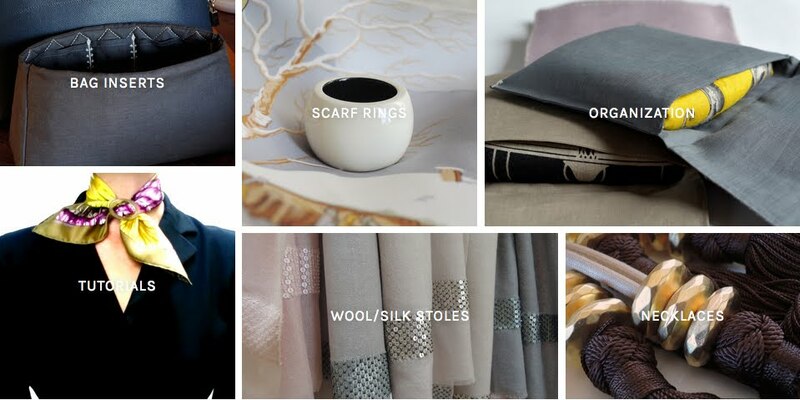 Clockwise from top left: Still-life by Gabriele, including a Grande scarf ring in sunshine honey. Macs with a shawl ring in dark sunshine as a pendant, Catherine with a waterfall necklace in aqua. 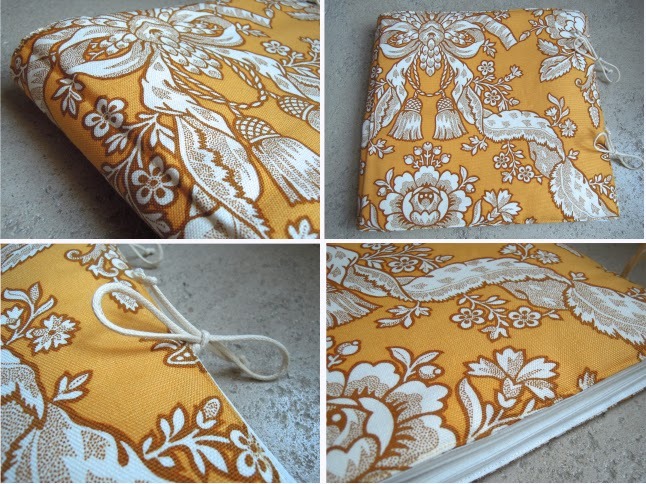 Clockwise from top left: Still-life by Sarah with a Scarf Travel Pochette in Toile de Jouy. Faux Fuchsia with a 'Printemps-Été 69/Automn Hiver' 70 Carré tied in ta cowboy knot with a moyenne horn scarf ring. Still-life by Sarah as before. sissy milano with an Hermès tie, secured with a Grande honey horn scarf ring in a criss-cross knot. 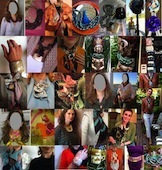 Top row, from left: Celeste's 'Casques et Plumets' 90 Carré as a necklace with Anneau Infinity scarf rings in black horn, and a shawl ring in sunshine honey. Manuela with a horn bracelet in noir. L'Orange Bliss with a 'Astrologie nouvelle perforée' 140 Carré in a waterfall knot, secured with a grande scarf ring. Bottom row, from left: Faux Fuchsia with a 'Trés Kelly' 70 Carre in a cowboy knot, secured with a moyenne scarf ring in honey. Macs securing the ends of her white shirt with a dark sunshine shawl ring in the basic slide. Johanna with a 'Trésor retrouvés' 90 Carré in a Asymmetrical wrap, secured with a Moyenne scarf ring in ebony. From left to right: Faux Fuchsia with a 'Ecurie' 70 Carré in a cowboy knot, secured with a moyenne horn scarf ring in honey. L'Orange Bliss with a Astrologie nouvelle perforee 140 Carré in a waterfall knot, secured with a grande MoP scarf ring. Clockwise from top left: Monica with a 'Zabavushka' 90 Carré and a Grande horn scarf ring in sunshine honey. Pam with a 'Pavois' Gavroche, tied with a Petite scarf ring in light honey into a basic slide knot. Faux Fuchsia with a 'Tropiques' 70 Carré secured with a Moyenne honey horn scarf ring in a cowboy knot. 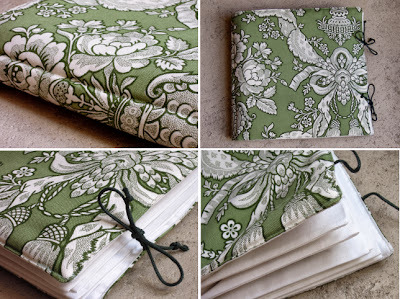 Still-life by Sarah with scarf travel pochette in Toile de Jouy. The scarf travel pochette now comes in a new version, which has a zippered compartment for scarf rings or small jewellery items in the back. It no longer comes in a gift box (although the gift box can still be purchased as an additional item). The previous model (without zip compartment and box) can be purchased with a 20% discount as long as stocks last. Loved the previous post as well and can't stop admirig your endless imagination in creating such great ways of wearing the Maxi Twilly. Manuela--You get the glorious hair award! And you tie a mighty stylish scarf as well. Sorry for my late reply to you dear ladies. Love this how fun to see everyones take on a classic...wonderful idea! Looking back, I can't imagine why I did not think of it in the first place... wish I did! What a happy and colorful collage. It is so inspiring to see how women worldwide style themselves. I know I've taken a page from Faux Fuchsia's playbook in wearing that necklace with my scarf. And last winter I embraced sequins and bought a sequined skirt! Thanks FF! And I know I've copied one of Macs knotting techniques. Thanks fellow scarf-lovers . . . and you Tai for including me! Fun and nice to see all these beautiful ladies with the same love of sophisticated accessories and having so much more in common than only H ! Thanks MT. Thinking about my Christmas wishes…. Do you think I could add a smaller scarf pochette for 2 ou 4 scarves (that we could carry in our handbag) with this so useful little compartment that you cleverly added to your It- pochette ? Thanks so much Christmas Father, I promise I’ll be a nice girl ! Such a fun post and so nice to see the ladies. Oh, dear Simone... your lovely comment disappeared too, so sorry for only publishing it now! Very happy you enjoyed the collage, thanks so much! I only found your lovely comment now, my dear Barbara.. please forgive me for not publishing sooner! I feel the same as you about this happy group, and would be thrilled to include pics of yours next time! It makes me tremendously happy, it is so very special and wonderful. Hope you will be taking part again in the next one! A message from the dedicated blog visitor who has not gained enough courage to participate (yet): you are all wonderful in your styles, I enjoy your outfits and beauty. Hugs to you all! Thank you so much for including me. I love my scarf rings so much and live in fear of losing them! 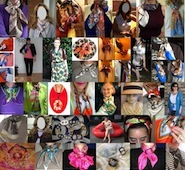 I always enjoy seeing how the other real life people wear their scarves and accessories. Off in a weeks time for a break in the sun with a friend to Ibiza (the quiet part! ), the weather looks changeable so deciding what to pack is difficult. 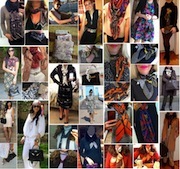 I have been scrolling your Pinterest Capsule collection board, its an excellent way to find ideas. I save them to my holiday packing ideas board on my pinterest... what would we do without Pinterest ?!? Have a most wonderful holiday! This time of the year must be perfect, still warm but sans le crowds.. Love Pinterest too! Congratulation on your new pochettes! Beautiful collage and all the ladies look wonderful. Oh, Beatrice you are so sweet! Charlize does rock a short do--I thought she looked positively fierce at the Academy Awards. Robin Wright also looks amazing in short hair. My cut was actually inspired by Halle Barry. Lea--the necklace is from Anthropologie. It's called the Verdura. It is as close as I'll ever get to owning any Verdura jewels! I bought it on sale last winter . . . to go with a Marni dress, also bought on sale! Couldn't agree more with you on how fabulous Marla looks with her short hair, dear Béatrice! Lea, you always ask the questions everyone wants to know about, you are a gem! Thank you Marla for being so sweet and gracious <3 Your fabulous styling makes the necklace beyond gorgeous (love the last picture in particular, so stunning with the Paridaiza)! Dear Marla - thanks for replying about the necklace. I agree with MT, your styling is very nice and makes the necklace even nicer. As a feedback - in last collage, you advised me about Marni for HM outfit and I managed to find the items afterwards. Wearing them and happy with both :). Lovley collages you made, the are very inspiring. I always enjoy your posts. Thanks so much, dear Bine! I feel also very inspired by everyone's contributions :-) Have a wonderful weekend too! Beautiful collage and yes very inspiring. Your lovely ladies' followers are also full of imagination with your items. Bravo Mai Tai and everyone for this wonderful post. What an incredible group of stunning ladies, all wearing and featuring gorgeous MT Collection pieces, each so creative and unique - truly a special family gathering! Thank you so much, dear ladies and MaiTai, you are all my inspiration!! Also thank you for another great invention in adding accessory pockets to your fantastic one of a kind Travel Pochettes! Much love and big hugs to you xox!